Going into the Tekken World Tour 2018 Finals no one was betting on Rangchu -- a South Korean player who specialises in using Panda and Kuma, two literal bear characters -- to win the tournament. After a whole year of competitive events across the globe, the finals were attended by the 20 top ranking players in the world. Rangchu had done well over the course of the season, consistently surprising crowds with his incredibly confident Panda and Kuma gameplay. But going up against Tekken legends such as Knee, Qudans, JDCR, Saint, JimmyJTran, and more in the World Tour Finals, no one could have seen him clawing his way to the top. At the event, Rangchu was able to make it out of his group in the winners side of the bracket, but in his first top 8 match, he was comfortably beaten by Knee, another South Korean player who had been dominating tournaments throughout the year. However, during their set, Rangchu had decided against playing as Panda or Kuma, presumably thinking that he couldn't possibly beat Knee with his big bear buddies. It was this cautionary and ineffective approach that perhaps spurred Rangchu on to stick to his animals for the rest of the tournament. After an intense showdown between Knee and fellow South Korean legend Qudans in the winners final, Knee was also sent into the losers bracket, where he would once again face Rangchu, who had been tearing his way through the losers bracket competition. Only this time, Rangchu opted for Panda, and, after a gruelling set, got the better of Knee and advanced to the grand final. Qudans, an unbelievably deadly Devil Jin player and last year's Tekken World Tour champion, put up a fantastic fight, but somehow, Rangchu was able to reset the bracket. Qudans certainly didn't go down easy, but with momentum on his side, Rangchu was able to string together a series of wins, pulling out some super risky but ultimately effective strategies. He ended up winning the final set 3-1. A Tekken tournament as big as this has never been won by a Panda or Kuma player, and again, no one would ever have bet on it happening. 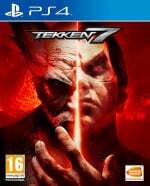 What's more, Panda and Kuma are generally considered to be 'low tier' in terms of character effectiveness, while Devil Jin, the character that both Knee and Qudans used against Rangchu, is widely considered to be one of, if not the best character in Tekken 7. It just goes to show that any character is viable in Tekken 7 -- and that's down to some evidently superb balancing on Bandai Namco's part. It's been a great year for Tekken 7, and for 2018's tour to end on such an unprecedented note, we suppose it just sums up how magical fighting games can be. I'll add a video of the grand finals as soon as I can find one. I think. I don't actually know if he cares about pandas or not. I've seen electric squirrels win tournaments, and a sentient universal energy take form as a talking frog on a chair. This is the most normal thing I have seen today. Added a video of the grand finals. Worth watching just for the awkward sweaty hugs at the end. @ShogunRok I like these high level play tournaments. I’m nowhere near that type of play style for any fighting game lol. But I wouldn’t mind if you guys covered more fighting game tournaments in articles. Street Fighter V, Soul Calibur 6, or even a King of Fighters 14. "Wow, it looked like they were about to kiss!" @shonenjump86 Thanks for the feedback, I'm glad you enjoy these kinds of articles. And I'd love to do more, but my issue is that I only really stay up to date with Tekken (although I know the main ins and outs of Street Fighter and Dragon Ball, too). If it's something enough of you want to see then we could try to cover more fighting game events in the future. Nice article. Well done to Rangchu. Kuma and Panda are really fun characters. There's actually a fuller video on YouTube including the presentation and interviews after. At least the panda had a matching handbag and bangles. That was a hell of a tournament, start to finish. Tekken isn't my main fighting game, but I really enjoyed the tournament. @Amusei Yeah it was Dimeback vs. Pekos. Absolutely insane set.